On the surface of the Earth, the intermingling of water and minerals gives rise to a diverse suite of reactions that determine the purity of water we drink, the fate of contaminants we emit, and the composition of minerals and biominerals that we use to interpret past environmental conditions from the sediment archive. Human societies have ubiquitous exposure to the outcome of these mineral-water reactions. Understanding in detail the ion partitioning in mineral- water interactions is of fundamental importance to geochemical studies and ultimately to society. The solid-solution properties of minerals are a significant part of the complexity, and also the importance, of these ion-partitioning reactions. Natural minerals always contain a certain proportion of trace elements in solid solution. These trace elements, precisely because of their rarity, often have a disproportionately large impact on living organisms as is the case for familiar toxic metals such as As and Cd. A clear understanding of ion partitioning behaviour is therefore essential for environmental objectives such as scavenging heavy metals from solution, remediating contamination in soils, or ensuring safe, long-term storage of anthropogenic CO2 or radionuclides in geological reservoirs. Materials science has also taken a new look at the role of trace-element and ion partitioning in regulating biomineralization. Finally, the last several decades have seen a surge in interest in reconstructing past climate and environmental conditions from the sediment archive. An accurate interpretation of ion partitioning is essential to the correct interpretation of records from diverse systems like stalagmites, corals, or shells of marine foraminifera. Given this wide range of applications for ion partitioning, it is fortunate that theoretical and thermodynamic frameworks for modelling ion partitioning have advanced significantly in the last decade. We believe that it is an opportune time to convene experts on ion partitioning from a range of perspectives, from theoretical to applied, to exchange knowledge across these topics and through this exchange, maximize the advances that have been made in the discipline. We are pleased to be able to convene these experts in person, at the European Mineralogical School in Oviedo in June 2010 to share these advances with each other and with the next generation of geochemists. It is our hope that this book will serve most crucially as a bridge through which researchers in one aspect of ion partitioning will be able to productively venture into complementary systems and models to better solve their research goals and perhaps be inspired with new research questions. The chapters in the book are arranged in thematic groups. The book begins with thermodynamic fundamentals and computer modelling of geochemical records. The first chapter by Manuel Prieto describes the equilibrium thermodynamics of ion partitioning for ionic substitutions with increasing degrees of complexity. Variations of the equilibrium distribution coefficients with changes in the background aqueous solution or in the composition of the solid as well as the methods are discussed in depth. Finally, the concept of supersaturation in systems involving solid solutions links this chapter with the following one, in which Andrew Putnis discusses the kinetic and mechanistic factors that influence the effective distribution of substituting ions under non-equilibrium conditions. Factors such as supersaturation, growth mechanisms, surface features, presence of organic molecules, etc. are illustrated with the help of a number of case studies. In the third chapter Dmitrii Kulik highlights some typical features of models of the equilibrium partitioning of inorganic ionic species between aqueous electrolyte and solid-solution phases. The emphasis is not so much on definitions and equations, but rather on providing some guidance about the methods and codes for geochemical thermodynamic modelling, and on showing how to use them in order to help understand ion partitioning in complex scenarios. The subsequent section describes four examples of ion partitioning in low-temperature geochemical systems. Michael Bottcher and Martin Dietzel focus on selected binary carbonate and sulphate solid solution aqueous solution systems and give a presentation of relevant current topics related to low temperature metal ion partitioning during complex precipitation and dissolution behaviour. 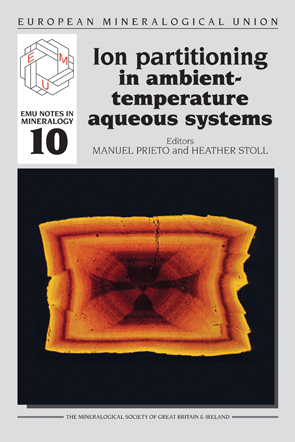 Christine Putnis and Lurdes Fenandez-Dfaz provide vivid examples of ion partitioning during low-temperature replacement reactions, underscoring the importance of the interaction not between the bulk aqueous solution but the solution in direct contact with the mineral surface. Christophe Monnin and Guilhem Hoareau give an account of the problems involved in characterizing chemical equilibria in the marine environment and focus on the development of an accurate model for seawater-type solutions, which is then applied to the analysis of the saturation state of seawaters and marine sediment pore fluids. Ian Fairchild and Adam Hartland describe ion partitioning between karst waters and host limestone and stalagmites, highlighting the links between ion partitioning and hydrology which can be exploited to reconstruct past changes in climate and hydrological balance. Speleothems also have potential to track broader biogeochemical cycles via substitution of ions such as sulphate or phosphate. The application of ion partitioning to solve problems of environmental contamination is covered by three chapters. Athanasios Godelitsas and Jose M. Astilleros explain how toxic metals can be removed from waters and soils by sorption and precipitation of metal-bearing solid solutions on the surface of minerals and how these processes can control both the dispersion and accumulation of these pollutants and hence their geoavailability and bioavailabity in near-surface environments. Eric Oelkers and Sigurdur Gislason describe how carbonation of silicates may be effective for permanent sequestration of anthropogenic CO2 and how carbonate mineral formation is favoured by the presence of reactive divalent-metal silicate minerals, in particular basalts and ultra-mafic rocks. Dirk Bosbach focuses on solid solutions that are relevant to longterm safety in nuclear-waste repositories. In particular, the structural incorporation of trivalent actinides and lanthanides into calcite and the incorporation of radium into barite are discussed in detail. The final two chapters in the book describe application of ion partitioning in marine biogenic carbonates to infer past changes in climate and ocean conditions. Corals which grow in the sunlit ocean, have been a key target for reconstructing tropical ocean temperatures in the past. Foraminifera and coccolithophorids, the dominant carbonate producers in the open ocean, provide the longest archive of ocean conditions with seafloor sediments dating back to the Mesozoic. Anne Cohen and Glenn Gaetani compare element partitioning during coral biomineralization with abiogenic aragonite precipitation from highly supersaturated seawater. They illustrate how simple evolution of the aragonite saturation state and Rayleigh distillation of trace element composition in a closed seawater calcification reservoir is able to explain the variation in crystal habits and the evolution in element/Ca ratios in corals as a function in temperature without invoking any additional purely biological effects. From this a robust multielement system can be used to calculate both growth temperature and degree of calcite production in corals. Heather Stoll reviews the main 'proxies' from trace element composition of foraminifera and coccoliths. In some cases ion partitioning can be assumed to be constant and temporal or spatial changes in the ratio of trace element/Ca in the ocean can be inferred. In other cases thermodynamic and/or biological effects on ion partitioning give rise to compositions dependent on ocean temperature, ocean carbonate saturation state or pH, or the physiology of the organism. It is worth noting that the terminologies and parameters used to refer to ion partitioning vary from some chapters to others. Even though this inhomogeneity can be misleading, we have decided to keep the terms as initially proposed by the authors because, in each case, these terms are the most familiar for the corresponding scientific community. A commonly accepted terminology does not seem to exist, which is not necessarily a problem as far as there is a specification of the terms used in each chapter. Moreover, a general presentation of the different terminologies and definitions is given in chapter 1. This volume would not have been possible without the cooperation and help of the authors, all of whom we thank. We thank Roberta Oberti and Fernando Gervilla for their enthusiastic encouragement and support. We are very grateful to Giovanni Ferraris for his extensive help in the review of the preliminary manuscripts. Finally, special thanks go to Kevin Murphy who made the main effort to complete this volume in record time. i-xi + 420 pages. ISBN 978 0 903 05626 7.